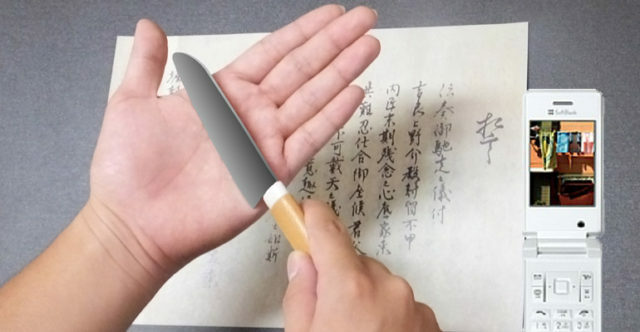 A gaijin made a smooth transaction today buying an inexpensive pre-paid phone by simply providing a birth certificate and a hanko seal stamped with her own blood. The quick transaction took Sally Rhodes just three hours of listening to terms and conditions and left her with a slightly bloody left hand. “All I had to do was slice my hand open and press the hanko stamp I had pre-ordered two weeks earlier into my open wound,” said Rhodes. A phone company spokesperson says the procedure is necessary to ensure the confirmation of the identity of the prepaid phone consumer. “It is absolutely paramount that we have the appropriate identification records for people purchasing prepaid phones in order to have appropriate identification records,” said the spokesperson.